What better way to chase away the winter blues than with a huge pot of molten cheese? The January detox has long since been abandoned and we’re ready for some Alpine-inspired indulgence! 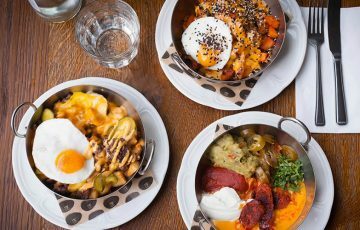 From cosy French bistros to pop-up ski lodges, here are five top spots to enjoy fondue in London this winter. Bringing a touch of Alpine glamour to the King’s Road, Bluebird Chelsea has installed three heated Chel-ski lodges on their famous courtyard. 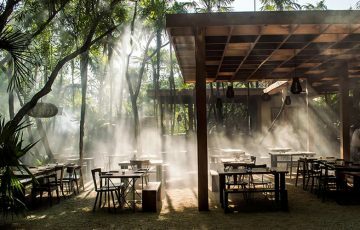 Hire a lodge before the end of February and you and your friends can retox in style with Narnia-inspired cocktails and warming winter dishes. 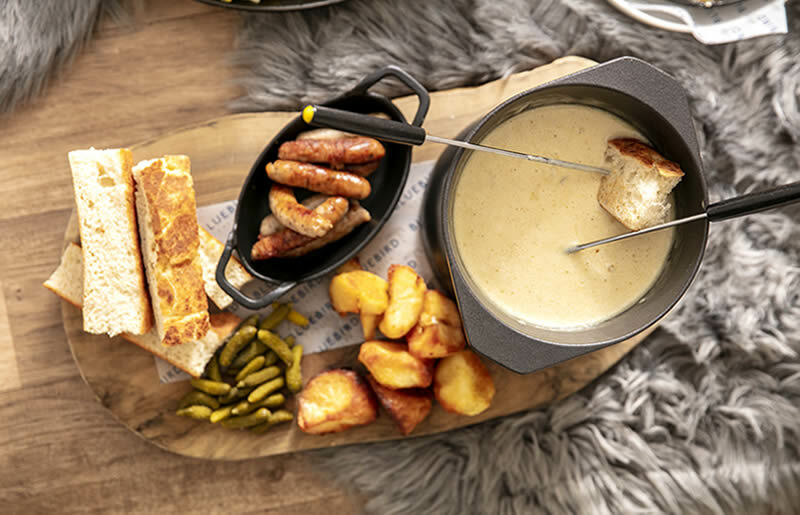 After a few White Witch Martinis, get stuck into the Gruyere and Montgomery cheddar fondue, served with baby sausages, roast potatoes, cornichons, and plenty of bread for dunking. There’s a veggie version, too, and warm apple pie for dessert. Don’t make big plans for later on – you’ll probably be in need of a nap. To book the Chel-Ski Alpine Lodges, call 0207 559 1000 or email enquiries@danddlondon.com. Spitalfields Market is packed with decent dining options, from street food stalls to restaurants like Blixen and Wright Brothers. 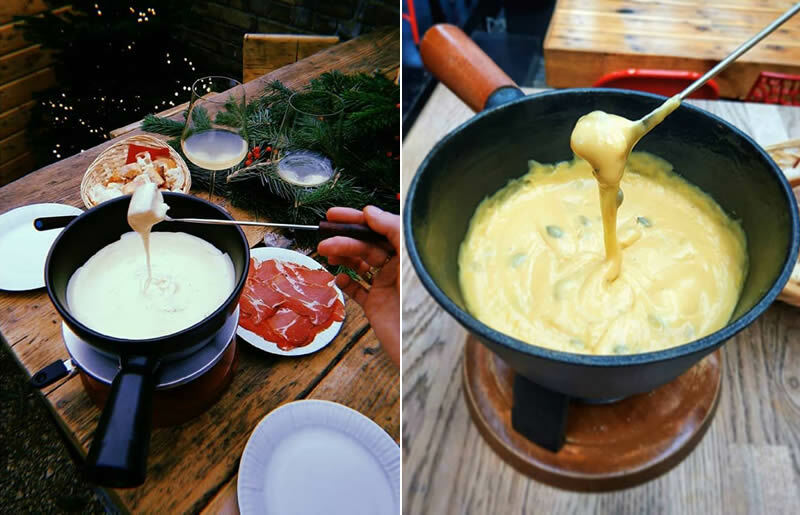 If it’s fondue you’re after, head to Abondance (formerly Androuet) – a cheese shop with a cosy bar attached. Try their classic fondue or seasonal flavours like pumpkin or truffle and then add sides like cornichons, potatoes or grilled chorizo. The friendly staff will be happy to suggest a wine to accompany your meal or a few cheeses to take home. Where better to indulge your passion for cheese than at London’s very own Cheese Bar? Situated in the Stables Market, it serves everything from grilled cheese toasties and queso fundido to cheeseboards you can pair with wine and beer. 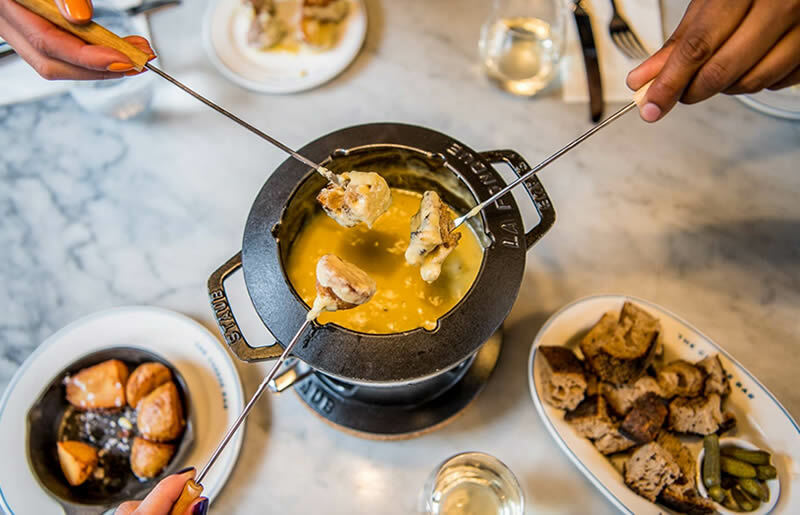 On Fondue Thursdays (until 28th Feb), there’s a choice of three fondues served with rosemary potatoes, bread and pickles, starting at £14 a head. The classic four cheese option is hard to beat but if you fancy something a little different, try the smoked cheese fondue with whiskey and bacon lardons. Gazette offers an authentic French brasserie experience, from terrines and pastries made in-house to steak tartare made to order at your table. 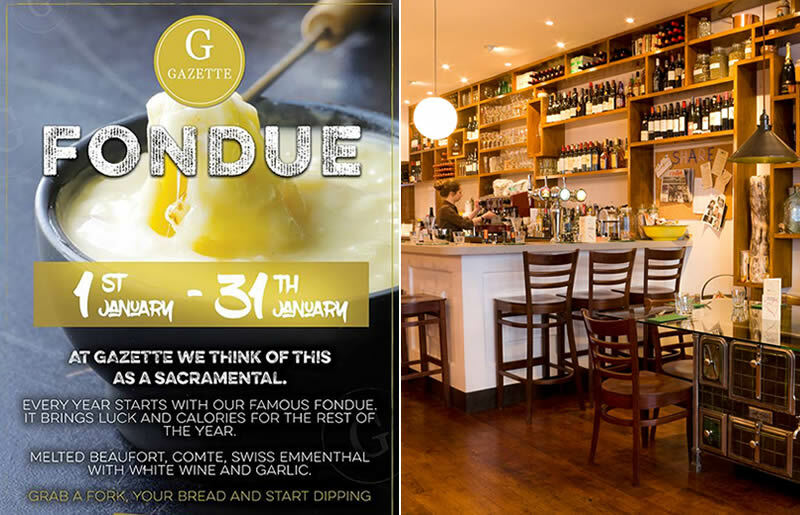 Throughout January, they’re serving their famous fondue – a blend of Beaufort, Comté, and Swiss Emmental with white wine and garlic – at their restaurants in Putney and Battersea. At just £15 per person, you’d be mad to miss out. Grab a fork and start dipping! 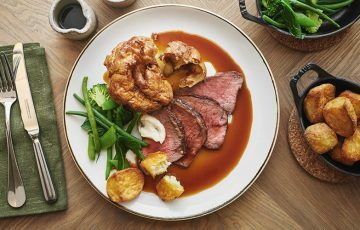 Home to the Ginger Pig, La Fromagerie and Rococo Chocolates, Moxon Street is a foodie haven just off Marylebone High Street. At the end of the street, you’ll find Le Vieux Comptoir – a charming French wine shop, deli and bistro – that’s perfect for long lunches and date night dinners. French food lovers can find all their favourites on the menu, from charcuterie and escargots to confit duck and steak tartare. 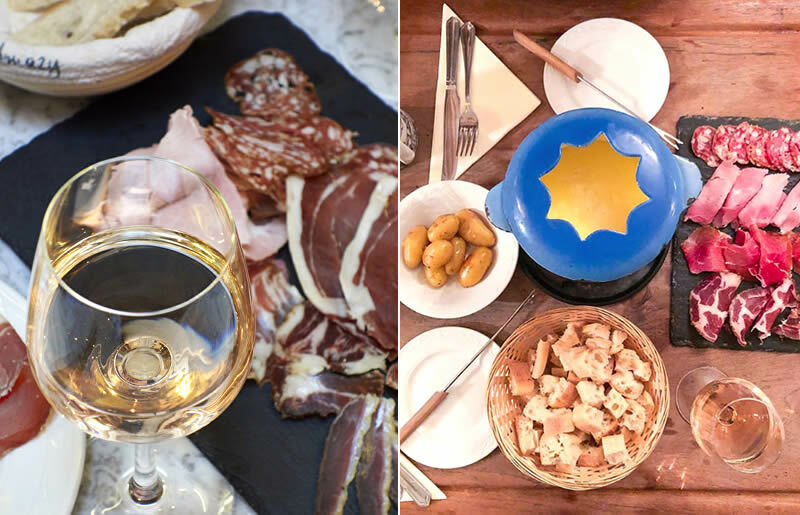 There are few better places to enjoy traditional fondue Savoyarde and a bottle of wine (or two) with someone special. Hungry for more? Enjoy even more molten fromage at St. Moritz, Walluc Bistrot, Alpes, and La Fromagerie. It’s also available at Patron – a candlelit bar à vin in Kentish Town – if you book ahead. Where’s your favourite place for fondue in London? Let us know in the comments.